Characterised as a peace-loving nation, Japan has earned this favourable international reputation through a combination of its culture and society. Also, the Constitution does not allow the country to possess offensive military capabilities. Nonetheless, it is involved in territorial and political disputes with most of its neighbours, and at times, its foreign policy is perceived as assertive by other regional actors such as the People’s Republic of China (PRC) and the Republic of Korea (ROK). Therefore, this article will explore the reasons why a so-called pacifist country such as Japan is involved in so many disputes. From a geopolitical perspective, Japan is situated in a region where history and historical memories still resonate politically, and continue to drive regional actors’ foreign policies, resulting in territorial and diplomatic disputes as well as long-lasting rivalries. In fact, the national perspectives of Japan and its neighbours are inseparable from their past experiences. Firstly, in order to understand Japan’s perspective, it is necessary to consider the nature of its “abnormalcy”. Realist scholars believed that the phenomenal economic development that Japan experienced during the second half of the 20th century would inevitably result in rising military ambitions. This was seen to be especially true, considering Japan’s imperialistic and militaristic past. However, Japan did not try to translate its economic might into military capabilities, nor did it attempt to challenge the hegemony of other powers. As a consequence, Japan has been considered an “abnormal” country, due to its “pacifist” behaviour. The idea that Japan is not a “normal” country, has been reinforced by its US-drafted constitution, implemented in the aftermath of the Second World War by American occupying forces. Japan’s Constitution, not only contains a peace clause, but is also considered rare due to its longevity. In other words, Japan may be considered an abnormal country because despite its economic power, it has not tried to develop modern offensive military capabilities; instead, the country has preserved a foreign-drafted pacifist constitution for over seven decades. Whether it deserves the title of “abnormal” is debatable, as it would imply the existence of some sort of international standard; nonetheless, considering its legal framework, society, and behaviour on the international stage, it is understandable why Japan is considered a pacifist and exceptional country. Domestically, Japanese society has been able to overcome its wartime experiences thanks to policies that guaranteed “peace and prosperity”. During the post-war period for example, Prime Minister Shigeru Yoshida developed the “Yoshida Doctrine”, which included a number of “pacifist” policies that were aimed at preserving peace while focusing the country’s capabilities on achieving economic prosperity. However, while Japan has been enjoying decades of “peace and prosperity”, the spectre of its behaviour in wartime has remained very much alive among its neighbours. After the war, Korea was divided in two different countries. Not only did this division result in numerous diplomatic and strategic issues, but also, as ‘halved’ parts of a single country, neither ROK, nor the Northern side – the Democratic People’s Republic of Korea (DPRK) – have managed to equal Japan’s economic development. This is perhaps unsurprising, considering the long-lasting effects of Korean War, in combination with economic sanctions, and trade restrictions. Furthermore, the diplomatic and strategic issues on the Korean peninsula have been exacerbated by the DPRK nuclear programme, and more specifically the recent missile tests. Similarly, the PRC has been dealing with its own problems following the Second World War, despite the fact they were on the winning side, unlike Japan. Yet, it did not feel like a victory for Beijing: as numerous social and economic issues affected the country, China had to watch Japan’s remarkable growth and development. While the Land of the Rising Sun was enjoying peace and prosperity, the PRC was dealing with the trouble of overcoming the “century of humiliation”, a period of foreign occupation, territorial losses, and military defeats that took place between the 19th and the 20th century. Northeast Asian rivalries fuel many disputes: all actors in the region have, to different extents, disputes with their neighbours, and Japan is no exception. What is notable is the vital role that historical memory plays in this volatile regional context. Accordingly, Japan’s involvement in disputes with other regional actors can be very largely be attributed to history. Following the war, Japanese society welcomed the advent of peace and prosperity, quickly adapting to the new image that Japan projected of itself at international level. The Japanese military was totally discredited, and with the help of US occupation, the country developed anti-militaristic norms. 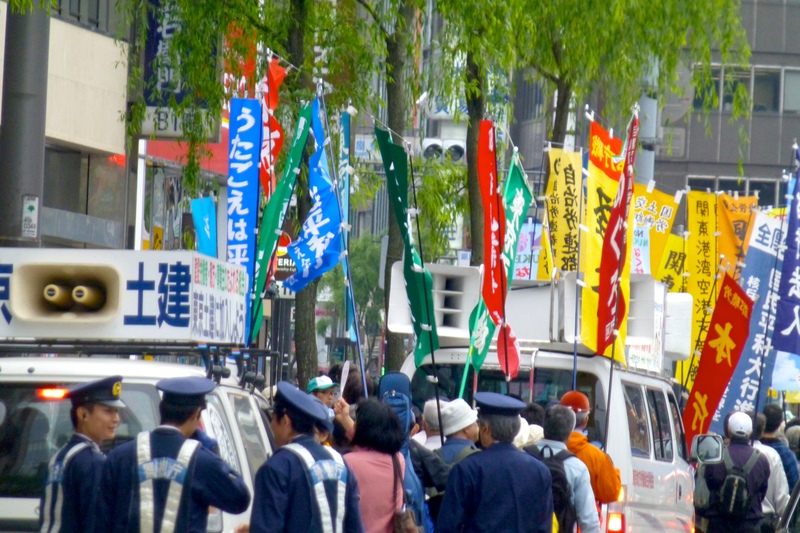 Japan’s national identity of a pacifist country is also demonstrated by public opinion polls on the country’s priorities, and the influence that the strong popular support for peace and prosperity has on the policy making process. As a result, at the dawn of the 21st century, Japan’s domestic memories of war were not forgotten, but were instead relegated to the past. By contrast, wartime memories were still vivid in among the populations of local neighbours including China and Korea. A fact that has been reflected in the Chinese “obsession” for power balance between the United States, Japan, and China, or in the long-lasting dispute on the comfort women issue between South Korea and Japan, inciting several diplomatic incidents regarding Japan’s apologies for sexual slavery during the Second World War. In the case of China, for example, the dispute on the Senkaku/Diaoyu islands has been emblematic in defining its approach to Japan: China has to show strength, to overcome its past “humiliations”. China sees the Japan Maritime Self-Defense Force (JMSDF) as an occupant of its territory, namely the ‘Diaoyu Islands’ (considered Chinese according to Beijing’s historical view). Conversely, Tokyo’s official stance is that ‘the Senkaku Islands are under the valid control of Japan. There exists no issue of territorial sovereignty to be resolved concerning the Senkaku Island’. Furthermore, as Japan’s military capabilities are intended for self-defence purposes only, what the Chinese consider an aggression, is seen as self-defence in Tokyo, a legitimate “resolute stance” (kizen to shita taido), also considering that the Senkaku Islands (Senkaku-shotō) are controlled by Japan as per the 1971 Okinawa Reversion Agreement. The Japanese perspective on this issue, which does not involve acknowledging a dispute due to the above reasons, only appears to be even more assertive in the eyes of Beijing. This is the essence of the regional security dilemma facing North-east Asia today. Similarly, Japanese society finds it difficult to justify the ROK’s continued emphasis on the comfort women issue. On the one hand, Japanese occupation and wartimes memories have not been forgotten in South Korea, and they remain a highly debated topic. On the other, having apologised multiple times, and considering itself a pacifist country and a “contributor to peace”, Japan sees South Korea’s insistence on this matter as unjustified. Further to social, cultural, and political differences, the divergence in perspective among these countries is also a result of the different kinds of narratives and government-led propaganda they are subject to. Japan’s national identity is that of a pacifist country, and one who is far more interested in promoting diplomatic relations than remembering historical disputes or rivalries. Despite its geopolitical role in a number of disputes, the country has enjoyed peace and prosperity for many decades, its society identifies itself as pacifist, and its behaviour on the international stage reflects its pacifist values. From alternate perspectives, it could reasonably be argued that its neighbours are generally more prone to fuel disputes, yet Japan’s conviction in its pacifist national identity might also mean it is failing to address these issues properly. In order to fix the conflictual relationship with its neighbours and prepare for future challenges, Tokyo should focus on taking into account its international image from the viewpoint of countries such as China or South Korea. Andrea (@A_Fischetti) is a MEXT Scholar researching on Japan and East Asian Security at The University of Tokyo. He is also a Series Editor for Strife. Andrea earned his MA in War Studies from King’s College London, following a BA with First Class Honours in International Relations, Peace and Conflict Studies. He was a visiting student at the Hiroshima Peace Institute of Hiroshima City University, and worked in the House of Commons. Kennedy, 1994; Waltz, 1993; 2000. Comparative Constitutions Project, 2017; Elkins et al, 2009. NHK, ‘Seiji ishiki getsurei chōsa’, 2007. Ministry of Foreign Affairs of Japan, 2016. Japan National Security Council, 2013. Asahi Shimbun (2012) ‘Abe Naikaku Sijiritsu 59%’, Asahi Shimbun, December 2012. Berger, T. U. (1993) ‘From sword to chrysanthemum: Japan’s culture of anti-militarism’. International Security. 17(4): 119-50. Berger, T. U. (1998) ‘Cultures of Antimilitarism: National Security in Germany and Japan’. Baltimore, Johns Hopkins University Press. Elkins, Z., Ginsburg, T. and Melton, J. (2009) ‘The Endurance of National Constitutions’. Cambridge: Cambridge University Press. Japan National Security Council (JNSC) (2013) ‘National Security Strategy’, provisional translation, December 2013. Katzenstein, P. J. (1996) ‘Cultural Norms and National Security: Police and Military in Postwar Japan’. Ithaca, Cornell University Press. Kennedy, P. (1994) ‘Japan: A twenty-first-century power?’ in C. C. Garby and M. Brown Bullock (eds) Japan: A New Kind of Superpower? Baltimore, John Hopkins University Press, pp. 193-9. King, A. and Taylor, B. (2016) ‘Northeast Asia’s New ‘History Spiral’.’ Asia & the Pacific Policy Studies, vol. 3, no. 1, pp. 111–119. Pugliese, G. and Insisa, A. (2017) ‘Sino-Japanese Power Politcs: Might, Money and Minds’. London, Palgrave. Rozman, G. (1999) ‘China’s Quest for Great Power Identity’. Orbis, 43,3, 383-402. Soeya, Y., Tadokoro, M., Welch, D. A. (eds) (2011) ‘Japan as a ‘normal country’? A Nation in Search of its Place in the World’. Toronto, University of Toronto Press. Waltz, K. N. (1993) ‘The emerging structure of international politics’, International Security 18(2): 44-79. Waltz, K. N. (2000) ‘Structural realism after the cold war’. International Security 25 (1): 5-41. Yoshida, S. and Nara, H. (2007) Yoshida Shigeru: Last Himeji Man. Lanham, Rowman & Littlefield.